Hector dreams of playing professional soccer, but as a black child growing up in apartheid South Africa, he experiences frequent denied opportunities because of the color of his skin. But as apartheid comes to an end in South Africa and Nelson Mandela is elected president, Hector both sees and experiences the power of sport to heal a nation. 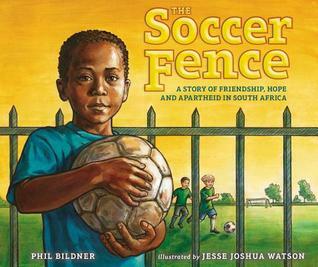 Beautiful and poignant, Phil Bildner's words and Jesse Joshua Watson's illustrations take the reader on an emotional journey of highs and lows and leave you with a joyous lump in the throat by the last page. No doubt fans of the movie Invictus with Morgan Freeman and Matt Damon will draw some comparisons to Bildner's story, as Mandela used the universal language of sport early in his presidency to try to help heal racial wounds in his country.